A great way to grow herbs is by planting them in hanging baskets that can bask in the full sun. Your herb baskets can be hung from an arbor or pergola above a deck or patio, or placed outside a kitchen window where harvesting is as easy as opening the window and snipping fresh greenery for your recipes. Planting a basket of herbs is much the same as planting any hanging container of annual flowering plants. Use a good potting soil mix that drains well but also contains organic material that will hold moisture. Adding a time-release fertilizer at the time of planting is a good idea, but herbs do not require as much feeding as ornamental flowering plants, so go easy. Line your basket with moss or a piece of landscape fabric before adding potting soil. This will both protect the basket and prevent soil from washing through the basket when you water. 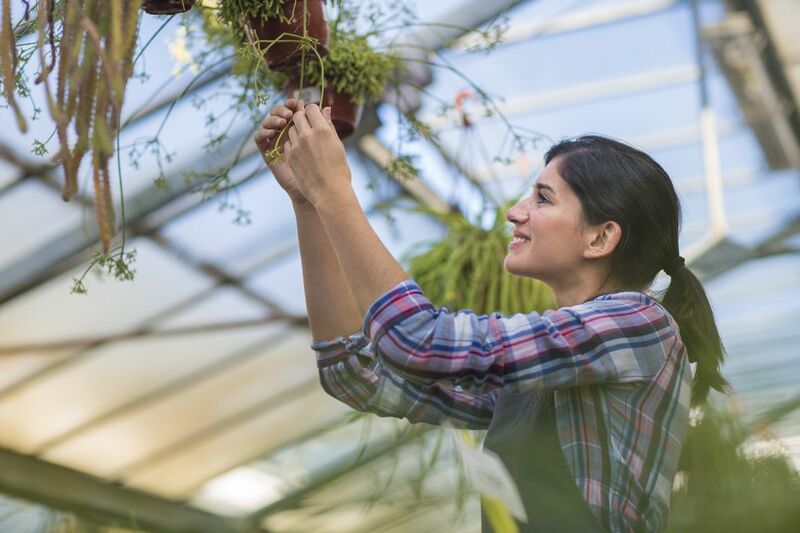 The larger the hanging basket you use, the more different types of herbs you can grow in it. The same principles used for creating ornamental flowering baskets apply to an herb basket. Include an upright specimen, such as lady's mantle; "filler" herbs such as savory; and "spiller" herbs that will cascade over the sides of the basket, such as creeping thyme. When planted this way, though, herbs can dry out a bit unless you are careful. Not every herb is suited for this environment, so it is important to choose herbs that are well suited. Here are five plants that are heat-tolerant and can stand to dry out a bit between waterings. Choose a prostrate or creeping variety of thyme (Thymus vulgaris) for your basket. Creeping Thyme will spill over the sides of the basket and will also help to shade the soil of the basket, slowing evaporation. 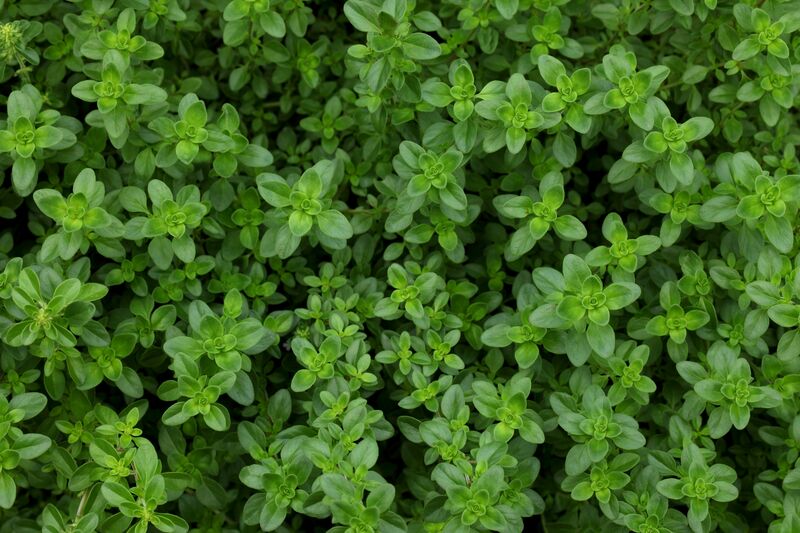 Thyme is a perennial herb, though often planted anew each season, especially when grown in containers. Winter savory (Satureja montana) is a fast-growing herb that tops out at about 12 inches high but can be harvested as soon as it reaches about 5 inches. It retains its pungent flavor, even when dried. Harvest a nip here and there as you care for your basket throughout the season. Rosemary ​(​Rosmarinus officinalis) loves growing in a hot and dry environment, making it perfect for a hanging basket. Make sure to choose a prostrate variety; the standard variety is an upright plant that can grow rather tall. Prostrate rosemary likes dry conditions, so make sure to plant it with other herbs with similar needs. You may be surprised to know that even sage has a prostrate variety: Salvia officinalis ‘prostrates ’ does well in a basket in full sun. Harvest it all season and dry it as you go. By the end of the season, you will have enough prostrate sage stored away to last the entire winter. Although sage likes plenty of Sun, it does not do well under extreme heat. It thrives, though, in a moderate climate when placed in full sun. Bringing an artistic flair to any gardening container, lady's mantle (Alchemilla mollis) is a delicate and lovely herb to include in a sunny basket. Lady's mantle is not an herb, but it adds shape to your sunny herb basket and can be used to make soaps and lotions. Although lady's mantle is a perennial plant, it is often grown as an annual when used in container gardening. How To Grow Comfrey and Are Its Uses?